ONE of Spain’s most revered chefs who started out mopping the floor of Madrid’s Club Allard has won the most prestigious prize in Spanish food. 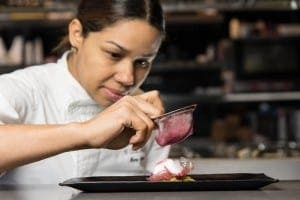 The meteoric journey of Dominican immigrant Maria Marte, who arrived in the Spanish capital in 2003 with the dream of becoming a chef, culminated last year. She won Spain’s national gastronomy prize for 2015 and, as Club Allard’s head chef, oversees around 1,000 plates as they leave the kitchen. “Mopping the floor was a very important step I had to go through to get where I am now,” the 37-year-old said.